off the high that was my Dot to Dot class with Angela Walters. All right, LOOK what my computer took me to when I went to get the URL to paste for her name!! February 25. I met Anna, my neighbour who lived across the street from us in Florida, a day or two after I wrote this. I knew she was a quilter, a young one, but little did I know that I already had met her, on two other occasions last year! She worked part time at Alma Sue's and was a member of the Sarasota Guild. She is the one who told me that the guild was bringing in Angela; had I not finally gone over to introduce myself, I might not have found out about Angela being here, certainly not in enough time to be able to get into the only one of her four classes that still had space. Sadly for me, Anna moved back to her hometown in northern Florida February 28. Happily, however, for me, I was able to get into the Dot to Dot class a few days later! Incidentally, Angela's post where I wrote this comment is well worth a read/watch. More than once. Not only did I have to remind myself to close my slack jaw in class when viewing her slide show, but I also had to make a supreme effort to swallow frequently; otherwise the drool would drip onto her beautiful quilts that we were allowed to touch, handle, hold, photograph, all to our heart's content. Recognize the fabric? 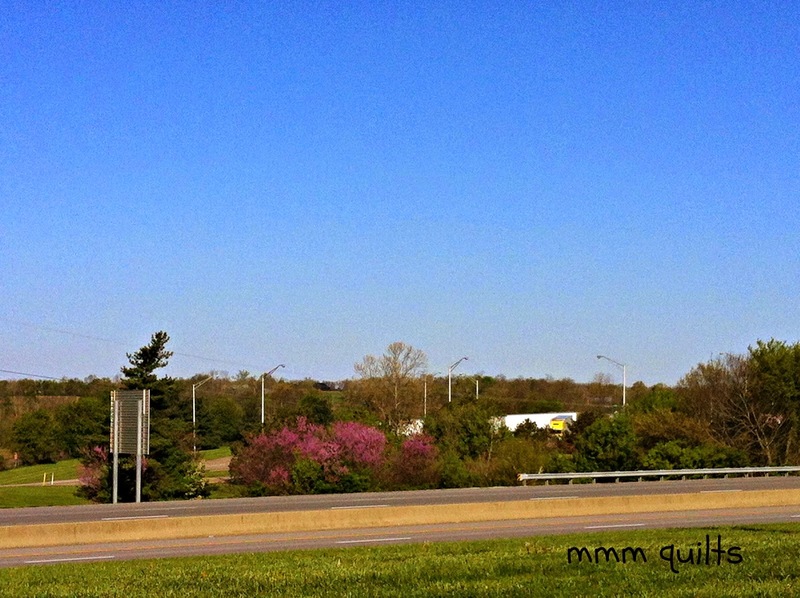 "Textures" -- look at the header of my blog! And yep, those are my legs, my fingers, holding (and before and after petting) her quilt. And THEN, there was meeting Angela, on Monday night at the guild meeting for the first time, eyes brimming with emotion as I tried (inadequately) to find words to tell her how much all her free videos and demos online, how much every single Craftsy class of hers has helped me, beyond measure, on my Avanté, but also has helped me grow in machine quilting on my Bernina. Going back Tuesday morning for another 3 hours with this warm, funny, ("My husband says I'm not funny. But I think I'm frickin' hilarious. Sarcasm is my love language!" 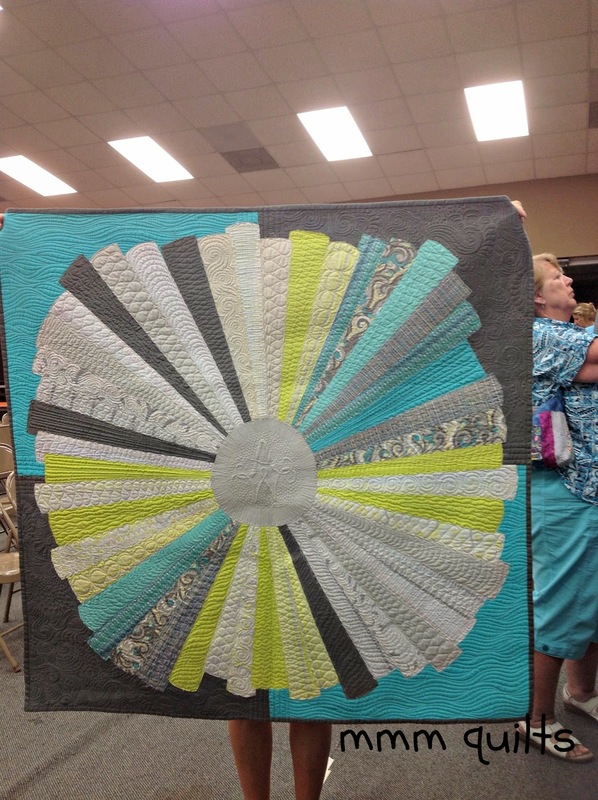 ) humble, genuine, inspiring, creative, and so-very-talented quilter was such a treat. 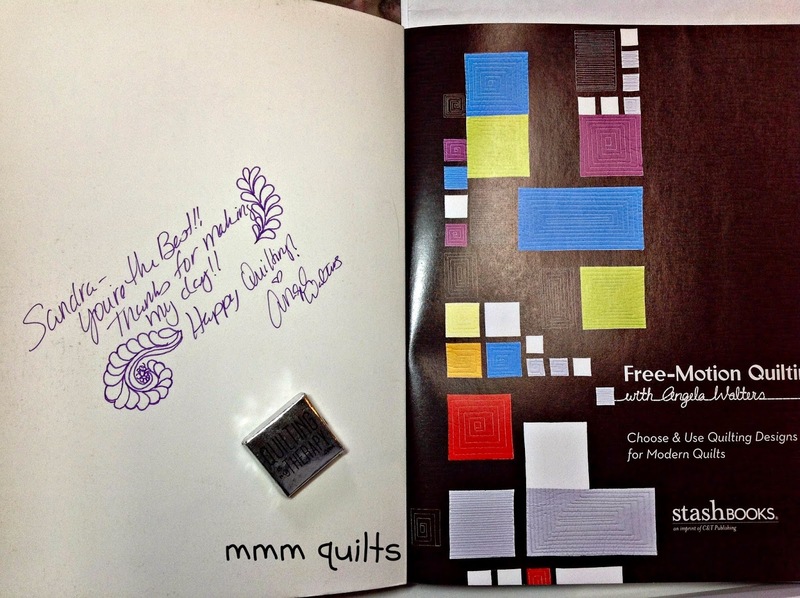 The chocolate says "Quilting is My Therapy", and yep I saved it, knowing I wanted a picture for my blog--I ate it after the pic, dark chocolate! But of course, she has taste. She is very wise. To fully round out my dorking out over her, geek that I am and always have been where school and education are concerned, I took notes, furiously scribbling to try to get it all down, even videoed segments of her instruction. 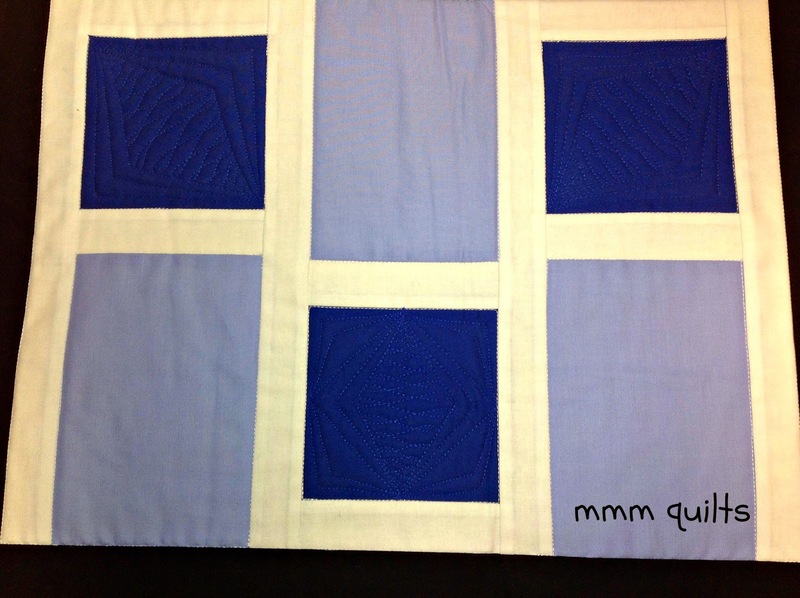 "There is no such thing as imperfection in FMQ. You just need to know how to fix them. " (the mistakes) She talked about the eye needing to see symmetry, and that symmetry is basically all it looks for, so "if you make a mistake, do it twice and then it's a design element!" I planned to rip this out as I messed up one of the "dots" to hit. Now, however, I'm thinking if I do something symmetrical on either side of this "mountain" it could look kind of cool. I need to get crackin' as these are my ALYOF April goal. Kinda cool here too, no? Although I didn't get nearly as much accomplished as I thought I would, my brain was totally full of information and inspiration. She talked, gave you theory and practical tips and answered questions, then showed you slides and her quilts and gave further clarification and ways to use particular designs, and then gave you 15 or so minutes out of each hour to practice the technique on your sample. 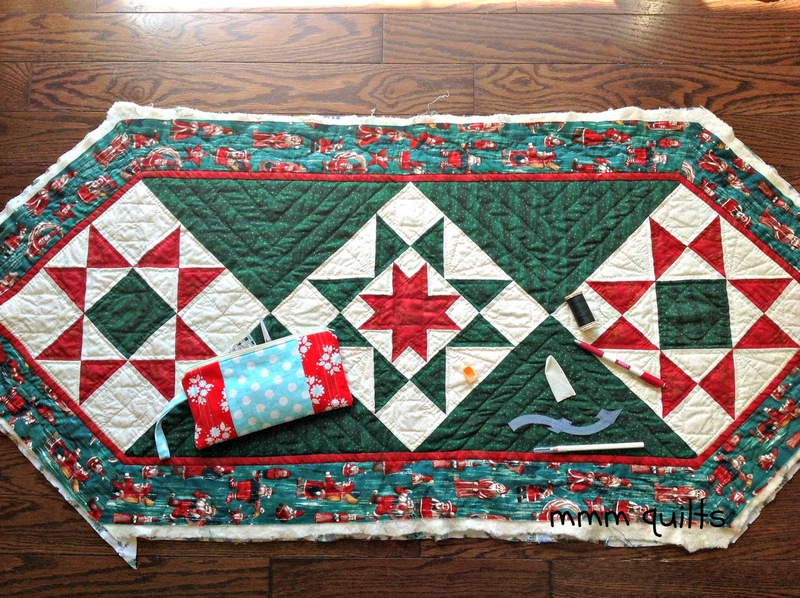 Each hour was broken down in a similar fashion to the Craftsy class: squares, triangles and then borders in the final hour. Rest assured there will be more Angela wisdom forthcoming. The trip home was uneventful. The dogwoods didn't disappoint, although there seemed less of them in Kentucky and Ohio than I saw last year through the Carolinas and West Virginia. On the trip, I actually got a fair bit done on the last border of my runner. I have about 10 more double-rows of the serpentine shape left to quilt. The little bag I made back in January came in so handy for my handquilting tools! Below you can see my favourite plastic open-backed thimble that allows your nail to be free. The condom-looking thing is a finger from a latex glove which I use to grab the needle to pull it through when 3-4 stitches are loaded onto it. 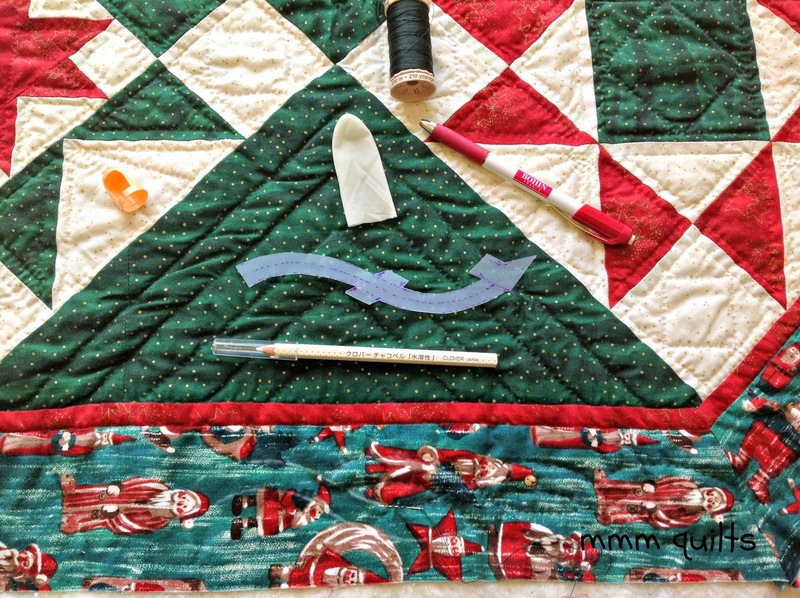 I'm using Gutermann quilting thread, and the Clover chalk pencil Angela uses (learned about these in one of her Craftsy classes). That pencil is better on the Old World Santa fabric than the Bohin one. There is too much white in the fabric; the streaks wreak havoc with my eyes, so I need a thicker line. The plastic serpentine shape is my template for marking the woven curves border design. And so there you have it, the first post back on good old Canadian soil. Mmmm. Even though said soil is a little darn cold for this time of year! Still, I think Spring is about to surpass Summer in my favourite season list. I was musing this morning (didn't get this finished last night, TOO tired after a 5 am start to the day--Mysore yoga!) that no matter whether one is living in 90F steamy tropical heat (Gulf, beaches, cicadas, palm trees), the tundra (pure white snow, frozen lakes, polar bears), or the desert (sand dunes, endless blue skies, meerkats(!!)) Mother Nature gives us something upon which our senses can feast, and our creative juices can start to burble. 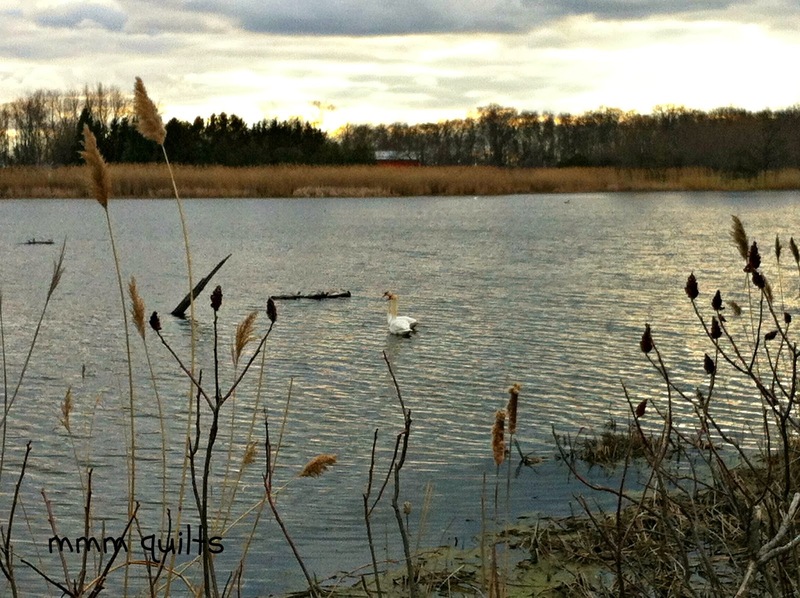 These swans literally took my breath away last night on the way to teaching yoga. I pulled over, got out of the car, crossed the road, tiptoed into the grass, but not before this pair had pulled apart...oh my GOD, but they were in the necks intertwined, facing each other, classic swan pose. That vision will stay with me forever. Rocco is happy; he has made a new friend. This is Charlie, an 8-month-old Scottie. He is adorable, although a bit rambunctious. Good thing Rocco is so tolerant. Charlie's 'mum' wants me to knock on her door and walk with them sometimes so Rocco can help teach Charlie some manners! They've recently retired here from Vancouver, and live just up the street. Welcome Home Sandra! Glad your trip went well and that you are happy to be back in Oh Canada! How fun that you and Rocco already made new friends! Really cool that you saw swans dancing. And you are so right about mother nature. SO many wonderful things in this post! Love your photo with Angela and the time with her sounds so great! You both look delighted and adorable! What an exciting class! Glad you are back home safely and it seems like your trip was a lot of fun. How lucky for you to be able to learn from someone you admire so much! 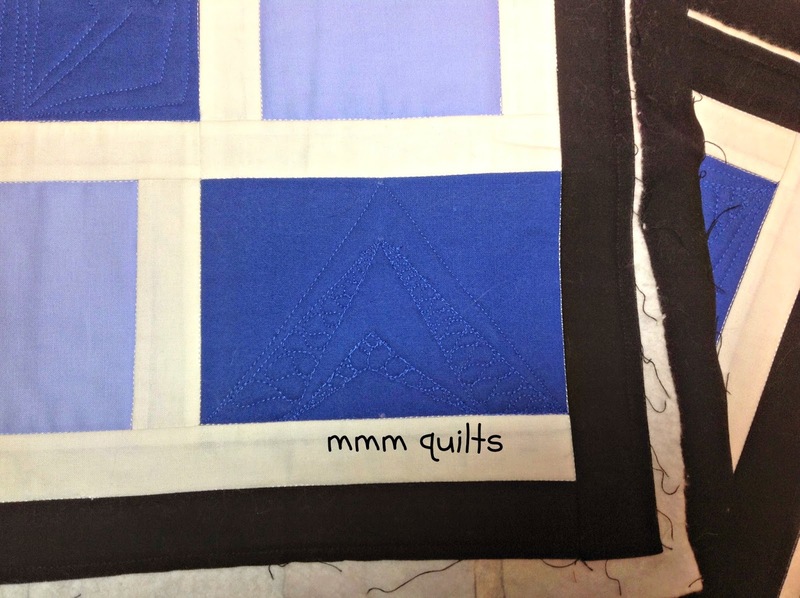 One of the things on my retirement wishlist is to learn to FMQ. I'm definitely going to have to take one of those Craftsy classes. Glad you are back to your summer home safe and sound! Chance of a lifetime I guess, with Angela!! Loved reading this. So glad that you are home safely. Your class sounds like an amazing experience. I'm a little jealous over here. ;) And you have made some great progress on your runner. 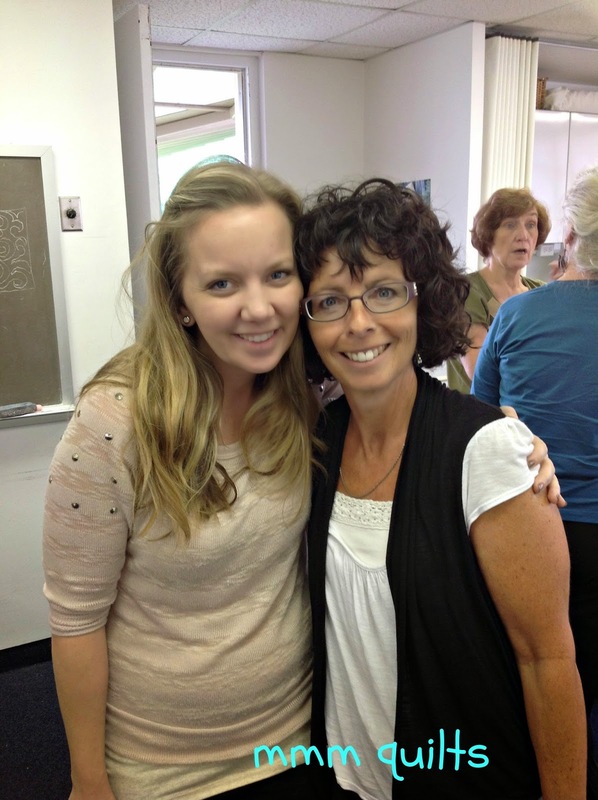 So glad you enjoyed your class with Angela Walters, then made it safely back to Ontario. Rosie and I could use some outings with you and Rocco too! 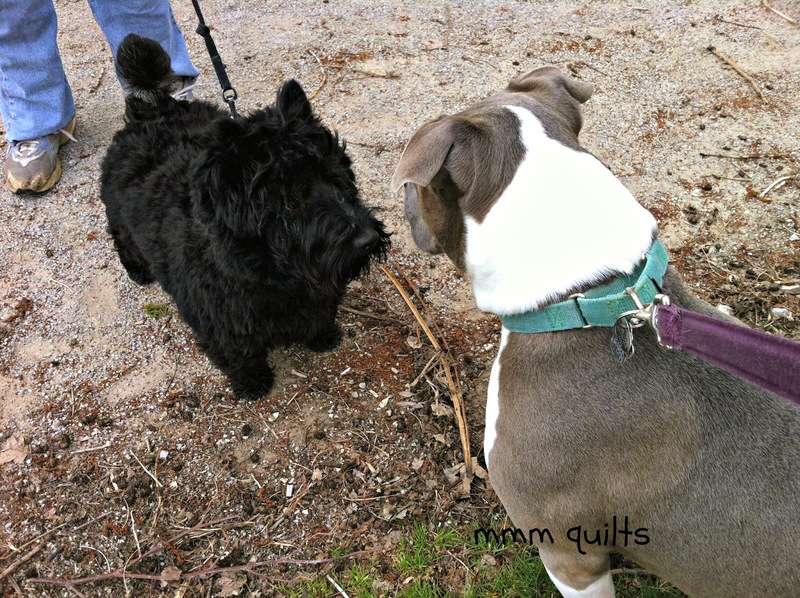 We're working on Rosie's manners when meeting other canines and two legged critters. I enjoyed your post...love the idea...when ya make a mistake...repeat and it's a design element! LOL!! I chuckled at your "condom-looking thing" that's just a finger cut off a rubber glove. Did you know that you can get something called "finger cots" at your pharmacy section of wherever you shop? They come in a little bag of maybe 100 for very cheap. They have the elastic-y end that hold them on your finger. This reminded me of when I had to a finger issue going on and needed to wear one. I'd leave them laying around, and my husband was horrified that someone would see one and think the tiny "condom-looking thing" might be for something besides a finger! Bwahahahaha!!! Fantastic post.Thanks For share this post with us. for the cheap bracelets than disbursal for the imitations. power forever gets its due respect despite during which kind it's conferred. treble clef bracelet Classical bracelets that you simply will wear within the evening for.